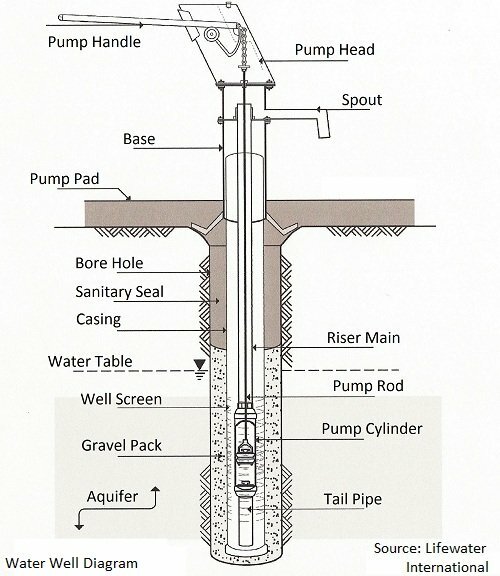 This water well diagram illustrates the components found in proper well construction. 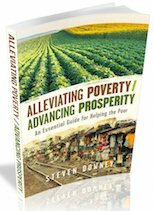 A water well is more than just a hole in the ground. Proper well construction, incorporating the right well components, can assure that the well you worked so hard to drill will provide clean, safe water for years to come. With proper well construction and design, you will maximize the amount of water the well will yield as well as the performance of the pump. You will also minimize the possibility of well contamination from surface water sources or infiltration of polluted groundwater sources such as those from latrines and animal pens. Check out the water well diagram below and the well components that will help guarantee a productive and durable well. Here are some of the more important elements included in the water well diagram above. Borehole – The borehole should be about 50mm (2 inches) wider all around than the well casing. The borehole needs to be clear of obstructions all the way down, and should be deep enough to reach the lowest expected water level. Casing – The well casing lines the borehole and is often made of PVC pipe. As stated above, if the borehole is 200mm (8 inches) then the well casing would be 100mm (4 inches) making a space of 50mm (2 inches) all around the casing. The bottom of the well casing is capped and the lower section is slotted to permit water to pass into the casing. Gravel Pack – This layer of coarse sand or gravel fills the 50mm (2 inch) space between the well casing and the borehole. The gravel pack allows water to flow from the aquifer into the well and should extend about 1 meter above the well screen. 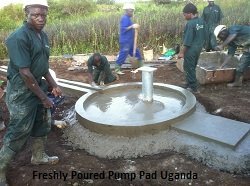 Pump Pad – Along with the sanitary seal, the pump pad surface water from contaminating the well. The pump pad is made of concrete and should be thick enough and reinforced with re-bar to keep it from cracking. Cracking would allow surface water to seep into the well. Sanitary Seal – The sanitary seal is made of a slurry of bentonite clay and cement. It is a good idea to add a layer of clay cuttings and bentonite (that have been removed during the drilling process) directly on top of the gravel pack. This will help seal the gravel pack and prevent the bentonite/cement slurry from penetrating downward into the gravel pack. The slurry is poured into the 50mm (2 inch) space around the well casing. It should extend from the top of the gravel pack all the way up to ground level. Rather than pouring the bentonite/cement slurry to make a sanitary seal, you may be able to use, what is called, the "tremie method". The tremie method involves pumping the slurry down a small diameter pipe like a 3/4 inch PVC pipe. The bottom of the pipe rests on top of the gravel pack and the slurry is pumped down the pipe and deposited direcly on top of the gravel pack (or on top of the cuttings and bentonite layer you layed down on top of the gravel pack). As the slurry is deposited, the "tremie pipe" is slowly removed from the borehole, depositing the slurry all along the length of the borehole, and all the way to the surface. This method helps assure a good sanitary seal that extends all the way to the gravel pack and has no gaps or air pockets in it. The pump pad and sanitary seal are extremely important in preventing well contamination. It is easier to include both of these components in smaller diameter wells (100mm-200mm) than in large diameter wells, such as hand dug wells. This is one reason that hand dug wells are more easily contaminated. Return to "Groundwater" from "Water Well Diagram"